A new plan for post-Brexit customs arrangements will be a "significant step forward", a Downing Street source has promised. The proposal, to be presented to ministers on Friday, will offer "the best of both worlds" - an independent trade policy and friction-free trade, the source added. But no details have yet been revealed about how it will work. Ministers have so far failed to agree what type of customs model to pursue. Friday's Chequers summit, which will be followed by a White Paper setting out more details, is aimed at finalising the UK's preferred path which can then be put to the EU. BBC political editor Laura Kuenssberg said some ministers appeared not to have been involved in drawing up the new proposal, which is being called a "third way" after two previous proposals divided opinion. Earlier, government divisions were underlined when Foreign Secretary Boris Johnson intervened in defence of Eurosceptic backbencher Jacob Rees-Mogg, who had been accused by two other foreign office ministers of "threatening" Theresa May over Brexit. Key things that have yet to be agreed are how the two sides will trade with each other in years to come - and how to avoid new border checks between Northern Ireland and the Republic, which is a member of the EU. Before reaching agreement with the EU, Mrs May needs to resolve splits within her cabinet on the shape of Brexit. The immediate problem with the "new plan" is whether or not it really exists. Because while Number 10 says it does, ask other people in government and they are not quite so sure. Ministers who you might have thought would be aware of the detail like - oh, you might imagine - the Brexit secretary had not agreed the lines, before Number 10 made their intervention. And it's said tonight that the reason he has not been involved in agreeing the "new plan" is because it does not actually exist yet. The customs decision expected in some parts of government therefore is what has been anticipated for some time as "max fac plus" - a souped up version of the proposal that originally won the day in the Brexit subcommittee what feels like a lifetime ago - with, you assume, a long lead-in time while the technology is made to work. Baffled? Quite possibly so. But it's perhaps only safe to say that four days before ministers are expected to actually make some final decisions, all is not precisely as you might have expected. Earlier, she urged the EU to consider her blueprint for future relations "seriously" as she updated MPs on last week's Brussels summit. 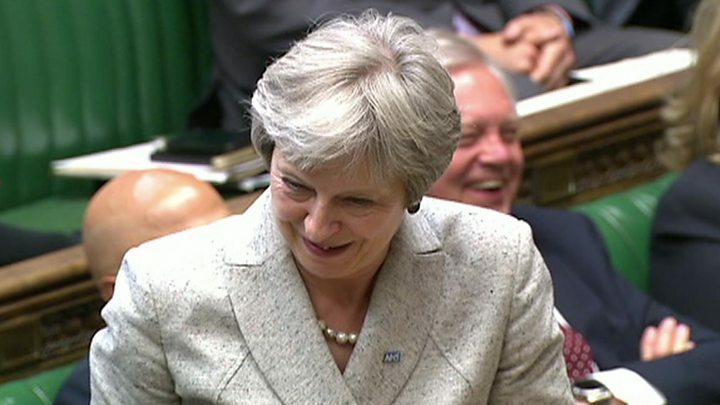 Pressed to give more detail of her plans as she took questions in the Commons, Mrs May said she hoped her vision for the UK's future relations would address the "real differences" on the issue of the Irish border. "The EU and its member states will want to consider our proposals seriously," she said. "We both need to show flexibility to build the deep relationship after we have left that is in the interests of both our peoples." Labour leader Jeremy Corbyn said the cabinet was irrevocably split between different Tory factions. But Mrs May rejected calls to "pick a side" between Remainers and Brexiteers, saying: "I have picked the side of the British people and these are the ones for whom I will deliver." She is also due to have talks in Berlin with German Chancellor Angela Merkel ahead of the Chequers meeting. Sources in both the European Council and the European Commission deny they have seen a draft of the UK's Brexit White Paper. Officials in Brussels predict it will mostly be a compilation of existing British positions - "a best of" is how one described it. Theresa May "hinted" at the publication of the document when she addressed EU leaders at their summit last week but she did not elaborate on its contents. Ministers from the remaining 27 member states are planning to respond to the White Paper at a meeting of the General Affairs Council on 20 July. EU officials expect to be going through the document until the end of July. The government has so far talked publicly about two potential customs options. One, a customs partnership, would mean the UK applies the EU's own tariffs and rules of origin to all goods arriving in the country and then hands over what was owed for goods that subsequently end up in the EU. The other, known as maximum facilitation or max-fac, aimed to employ new technology to remove the need for physical customs checks where possible. 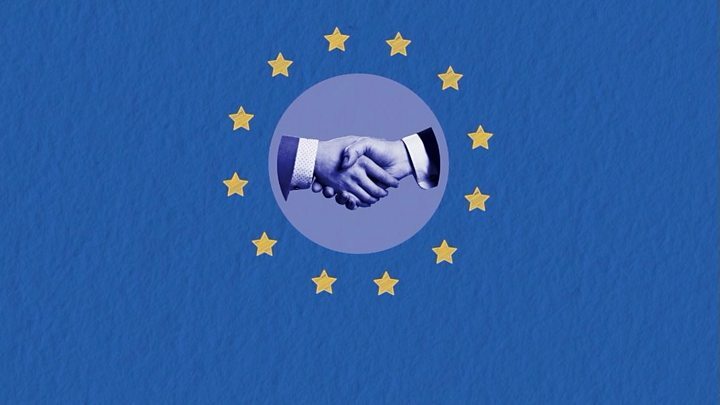 It is understood both options have been deemed practically or politically undeliverable and a third option is on the table, believed to involve "alignment" with the EU in regulations covering trade in goods but a looser relationship for services. Writing in the Daily Telegraph earlier, Mr Rees-Mogg said he and other members of the 60-strong group of Eurosceptic Tory MPs he leads, known as the European Research Group, would reject a deal that did not amount to a clean break with the EU. Mr Rees-Mogg said a deal which restricted the UK's ability to make trade agreements with other nations or control migration could not be accepted and Mrs May "must stick to her righteous cause and deliver what she has said she would". But, speaking in the Commons, pro-EU MP Anna Soubry said the public were tired of what she said were continual "fudges" on key questions and urged Mrs May to stamp her authority once and for all. And her colleague Nicky Morgan said Mrs May "would not be thanked for the mess we will end up in" if the government did not prioritise the needs of the economy in a "pragmatic, sensible, flexible" Brexit. The Democratic Unionist Party, whose support Theresa May needs to have a majority in key Commons votes, said it would not support any deal which did not give the UK full control over its borders. "We don't give blank cheques to anybody," its Westminster leader Nigel Dodds said after meeting the PM for an hour in Downing Street. "We want to see a proper Brexit which fulfils the referendum result but we have been very clear that it has to be on the basis of the whole of the UK leaving the EU as one." He accused Dublin and other European capitals of trying to "bully" the UK and using the issue of the Northern Irish border to "create an outcome which is to their liking", adding "they won't succeed in that".